Chennai Sangamam Scence - Nageswarao park, Jan 14, 2009, originally uploaded by rviswana. This is perhaps one of the best avenues for the budding artists. 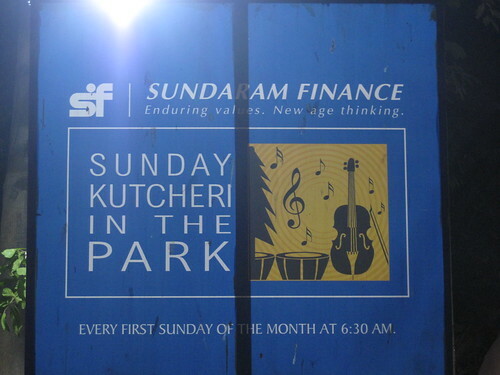 Young performers to apply to perform at the park which happens on the first Sunday of every month. Sundaram Finance sponsors this program and interested folks can apply here. Though this is an interesting proposition, budding musicians who are already nervous will have to perform without any audio system and will have to constantly battle the omnipresent mosquitoes. Even with these limitations, this a popular avenue and there is competition to get a slot.